Hi! 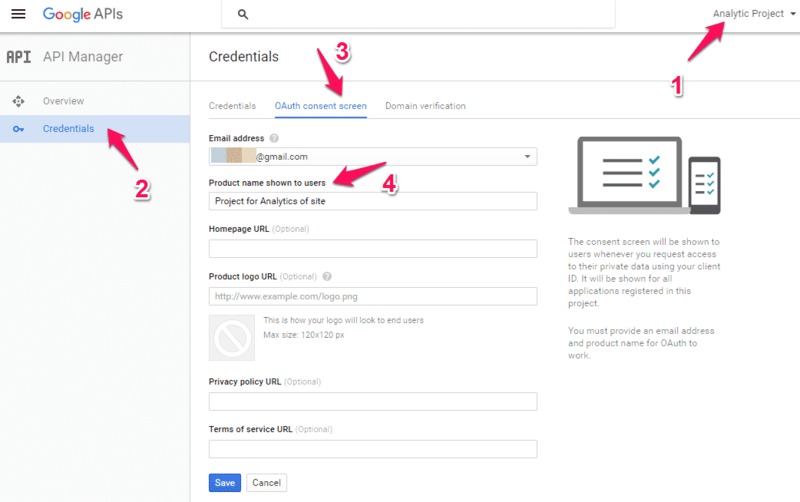 Are you going to creating an application that requires Google data to it? For this purpose, you need Google APIs.Google Developers Console is a site that is used by the developers for managing and viewing traffic data, authentication and billing information for Google APIs. To access the Google APIs our project must be registered on Google Developers Console with your Gmail. When we creating a project on the Google Developers console Google give can keep track of which application are making requests to their APIs and make sure that the API is not being extremely spammed by one application. Let’s start to play with Google Developers console for achieving the Google APIs. 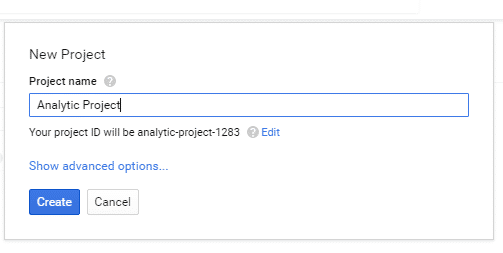 In this tutorial, I’m going to add the Analytics API for our project but you can get any API to follow this tutorial. After register at Google Developers console, bellow screen will be appearing. If you have created projects in Google Developers console before, you’ll see the list of created projects. Click on ‘Create’ button. Your project will be created and enqueue in Console project list. Select your project from the top right drop-down list and set the “Credentials”. Check your Mailing address and set the name of your project that is showing to the user. We have now created our 1st project on Google Developers console successfully. After creating a project lets discuss something about Google APIs. Google has a list of APIs that they open for the community to use them. Most of them are free while few are paid, you’ll have to pay for use of them. 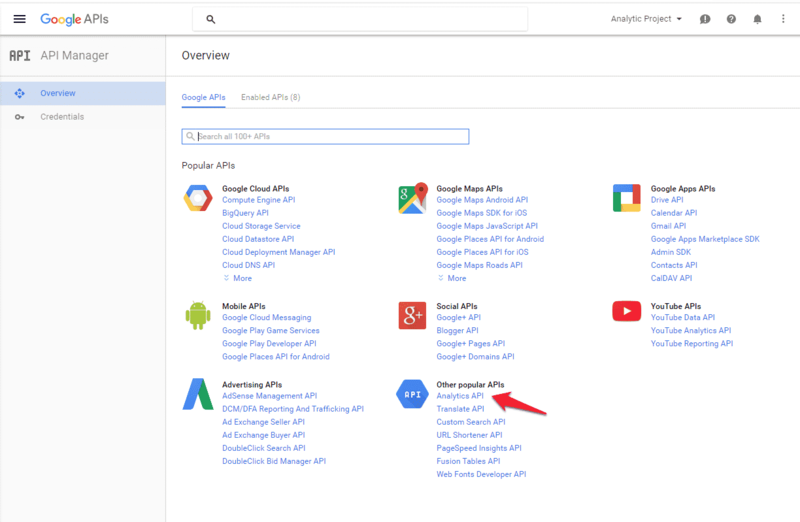 You can see the list of all popular Google APIs that you can be accessed. In the start of the tutorial, I’m saying that I’ll use the Analytics API, but you can use any other API for your project along this tutorial. Awesome? After Enable API. That API is adding in your project. There you can see a tab with Overview, Usage, and Quotes option. Quotas: gives you information about the default quota for the API. By default, you’re allowed a limited number of requests with respect to the API per each day. A request is any message that sent to the API. APIs normally return a max result set per request let’s 100 rows, if there are more than 100 rows then a second request must be made to get the next 100. Each request to get the next set of rows is requested. 1000 rows at the 100-row chunks at 10 quota cost. The Quota is the number of requests you are allowed to make a Google API without requesting permission to access more. In Analytics API, you have access 50000 requests per day. You can extend your Quota by requesting. 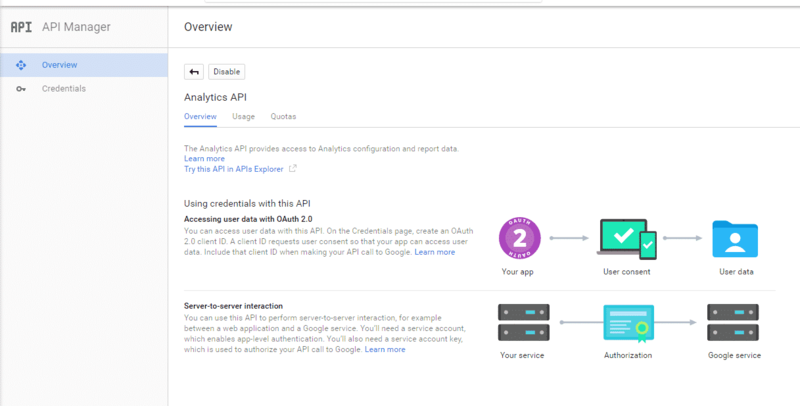 Read more about Analytics API limits and Quota. Warning: If you apply for an extension of your Quota and you disable that API you’ll lose the quota extension and have to reapply for it again. Don’t disable an API and re-enable it. It’s seriously dangerous button.